Because any activity is seen as a modern project, with a complex character, which requires a new vision starting with needs analysis of the project and finishing with an efficient reuse of project results, project management is the principal activity, ”dictantemundo”, of EprojectConsult Organization. The defining characteristics of the organization are, in addition to professional and managerial competence, staff ability to work in teams, pragmatism, clarity and simplicity in action and the last but not least, respect for our partners. 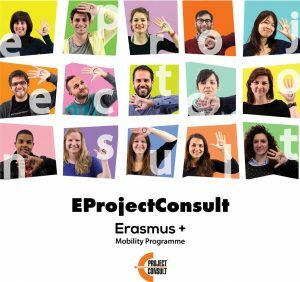 Already have passed two weeks and the daily activity within the EprojectConsult office as a freshly intern is marked by sharing an exciting environment where collaboration is a pleasant and efficient way in achieving the best European projects within the LLP program and not only. The first days were emphasized on the offered contribution towards reissuinga project belonging to the”Europe for Citizens” program, which was a real challenge, involving partners from 7 adherent countries of EU and acceding countries too who wanted to develop a network of twining cities in a field with a high interest for the European Union, the environmental cooperation (within Measure 1.2 of the program). First round table meeting of all office members has made ​​in order to bring ideas and practices following the completion of the project. With the first emotions, the project was applied in the final version, few days before the deadline. The projects improvement of our partners from Romania and Croatia passed as principal activities of the agenda after the previous project post. The opportunity to contribute in giving advices to our partners who wishthat, through their projects to fulfill dreams, gives you an indescribable satisfaction. This happened in these two projects, within the Leonardo da Vinci VETPRO, strategies of promoting rural tourism in Europe and acquiring experience in project management are just some objectives that provide the meaning for this two projects. The daily contacting of the partners is an important activity that must also be maintained by sending emails and letters of intent and reading the responses, this in a continuous and efficient cooperation. The weekend leaves to you two wonderful days of relaxing in a sun radiant environment in the middle of winter, which summarizesvisiting of the little town, of 45.000 inhabitants, BarcellonaPozzo di Gotto and its surroundings, ending our day with an evening out with all EprojectConsult group. Also, joining the youth group from Macedonia in the Sunday’s trip to the active volcano, Etna, was an unique moment of excitement, sharing exceptional landscapes and learning new things related to geology, thanks to our guide, geologist in environmental sciences,dott. SandroPrivitera, for which the volcanoes have more than an appearance, a body, they have a soul,as well as human soul… Walk through the beautiful city of Catania were also marked by future beautiful memories.